Welcome to the new little section of my blog! 'Sunday Snippets' is a place where I will post just a couple of snippets from my week each Sunday. Hope you enjoy! 1. This is my biggest and most favourite news for this week! I TRIED AND LIKED COFFEE! Oscar has been constantly pestering me to get into coffee as I always get tired easily and he says its such a great energy-booster. So the other morning he made me a lovely milky latte when I got up, and it was delicious! I never imagined liking coffee because my heart truly lies with tea, but it was SO nice. From now on you will probably find me with a latte in my hand each morning. 2. 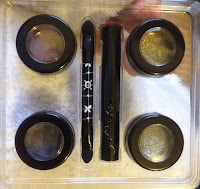 This week I also re-discovered a little make-up set that I had completely forgotten about! I received Fearne Cotton's 'Shimmering Eyes' set last Christmas and honestly forgot about it until I stumbled across it this week. Unopened, I was very excited to try it out as I am a big fan of Fearne Cotton and this little set looked delicious! The 'Shimmering Eyes' set included four eye shimmers and glitters, one applicator and one eyeshadow base stick. I've never used an eyeshadow base stick before so that was new! After playing around with the glitters and shadows, I decided to do a simple smokey eye. I found the eyeshadow base stick to be really useful - it helped set the eyeshadow dust and also added an underlying shimmer. The eyeshadow dust that I used is a lovely dark grey and blends very easily, allowing you to easily create darker and lighter tones. Finally, I used the silver glitter on top. It's basically just loose glitter but it rubs into the dust and makes your eyes sparkle. Although my smokey eye doesn't quite deliver as good over the camera, it looked lovely and I was very happy! I love finding things you'd forgotten about. 3. Aaaand just a little bonus snippet for you! cute cute blog! so happy you found mine =] and your eyelashes are to die for!! hope you will stop back by! oh, your eyes are so beautiful! Can someone say Glamorous Beauty?